Bose SoundSport Wireless review | What Hi-Fi? Apple takes the headphone jack out of the iPhone and what happens? People don’t stop buying iPhones, they start buying wireless headphones instead. For those who really care about sound quality, Apple’s own AirPods won’t cut it – but the Bose SoundSport Wireless might. They’re some of the best-sounding, most reliable in-ear headphones you’ll find for under £150/$150. 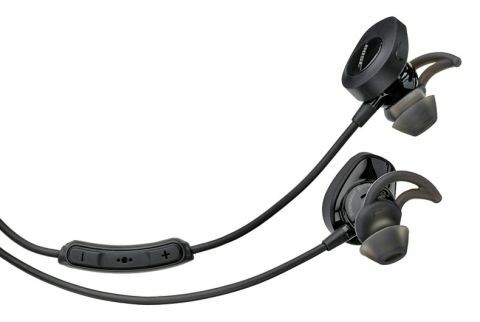 The Bose SoundSport Wirelesses are perhaps a more traditional pair of wireless in-ear headphones, if such thing yet exists, with a neckband cable incorporating a remote housing part-way down rather than the earpieces being untethered – or 'truly wireless'. They are a savvy design. The remote barely weighs anything, leaving nothing to drag the cable down, and they are comfortable to wear. The soft silicone rubber hooks trace the basic lines of the ear, making the fit secure enough for running or going to the gym. Importantly, the Bose SoundSport Wirelesses are sweat resistant and certified to IPX4, meaning they can’t be submerged but will handle sweat and splashes better than normal earphones. Even if you don’t care about the sports side, the hooks are important because, while the remote is small, the Bose SoundSport Wireless earpieces are quite large. It’s likely this is where the batteries and DAC live, needed in any wireless pair. As a result of not having a big battery pack as part of a rigid neckband, the battery life is a modest six hours, but that should be more than enough for the average workout or commute. There’s no cable socket for use when the battery runs out, so they won’t quite do for transatlantic flights. NFC is another bonus feature. With an Android device that has NFC, you can just touch the phone to the earpiece to make the two connect. But all these extras are meaningless if the Bluetooth chipset isn’t good enough to stop wireless bloopers and drop-outs as soon as there’s some interference. The Bose SoundSport Wireless’ Bluetooth performance is very solid, though, able to take on trains and offices full of mobile phones without wireless integrity falling apart. The Bose sound is perfect for this kind of earphone too – the kind of powerful, punchy bass that might get you running that bit faster. It’s not soupy, sloppy bass that spoils the rhythmic impact of a track either. For listening in a quiet room it may seem a touch aggressive, but that’s not really what the Bose SoundSport Wireless are for. These earphones are dynamic and make music sound lively. They’re fun all round, and that you can get greater tonal fidelity in the bass from a non-wireless pair at the price doesn’t slap you around the face. While the SoundSport Wirelesses don’t have the stellar insight of some earphones at this price, they are among the best-sounding wireless in-ears. Bose has managed to craft a sound signature with no glaring flaws: no harshness, good detail and no clear focus on one part of the frequency spectrum that might turn some of you off. Solid dynamics make the music sound lively too: it’s not just down to the fun bass. The Bose SoundSport Wirelesses are the more conventional siblings of the SoundSport Pulse. They lose heart-rate tracking, but keep everything else. They are comfortable, sound great, are easy to use and don’t cost more than their high-quality rivals.